Every plant evolved in and lives in context. They are dependent upon it for continuing support, not just for their survival, but for their well being as they grow, mature and attempt to reproduce. It is not just competition out there. Though we may order them from a catalog, grow them from carefully collected seed, receive them as gifts from a friend or purchase them from the shelves or rows at a garden center, they are individual plants, removed from their context…their futures’ will be short if we don’t make some attempt to recreate it. Sphaeralcea ‘Childerly’, from the Dancing Oaks catalog, though it’s not currently listed. Sphaeralcea are often called Globe Mallows and are another member of the large Mallow Family, the Malvaceae, some 244 genera with 4,225 known species. I’ve written recently of Anisodontea another genus of the family. Most of the 40-60 species of Sphaeralcea are North American natives of dry areas, growing from the Great Plains west and south into Mexico, with a few occurring in South America while a few others reaching into southern Canada. They include annuals, perennials and shrubby species, I’m looking here at perennials, all of which have very long bloom times, often spanning the entire summer into fall. 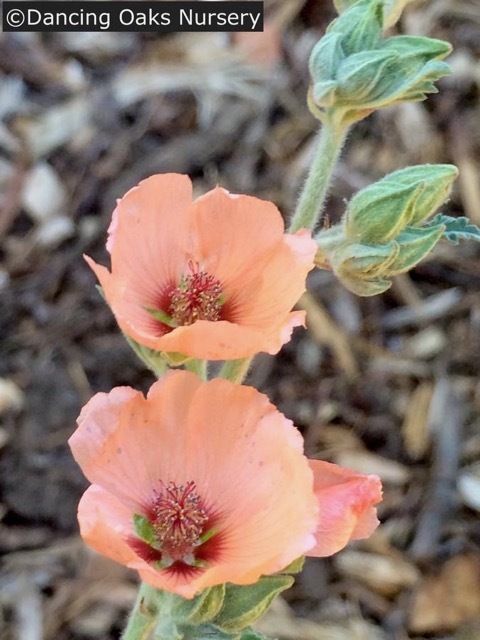 This entry was posted in Botany, Evolution, Natural Areas, Plant Choice, Plant Selection, Right Plant Right Place, Site Analysis, soil drainage, Sustainable Landscapes, West Coasties, Xeric and tagged Columbia Plateau, Desert Southwest, Great Basin, Sphaeralcea cultivars, Western Natives on January 22, 2019 by gardenriots.